Nails are the one thing that gets left until last for me when I'm getting ready, purely to avoid smudging whilst trying to do everything else, but more often than not I'm running late and end up doing them either in the car, on the plane.. you name it, I've probably attempted it! I'm currently in London for a three day stay and used the two hour train journey as a good excuse to give myself a mini mani. All the bits I brought were travel friendly size, popped in a smaller pouch inside my makeup bag. It also meant I had them in case of any nail emergencies while I'm away (a gal's gotta think of these things!). I started off with a generous amount of the Liz Earle Hand Repair. An easy way to remove old nail polish on the move is with Deborah Lippmann's The Stripper To Go lavender lacquer remover mitt. The mini mitt fits over one finger and cleans all 10 nails, it has a really fresh scent, prevents dehydration and keeps cuticles soft. Alternatively, Boots do polish remover pads in a small pot. Something which I always have to hand is the Stylfile Emergency File as it attaches to your keyring. It's a baby version of the original S-file and S-buffer combined and is protected by a spiral casing to stop it getting scratched or scratching other things. I also had a mini cuticle pusher to neaten up around my cuticles before applying a polish. 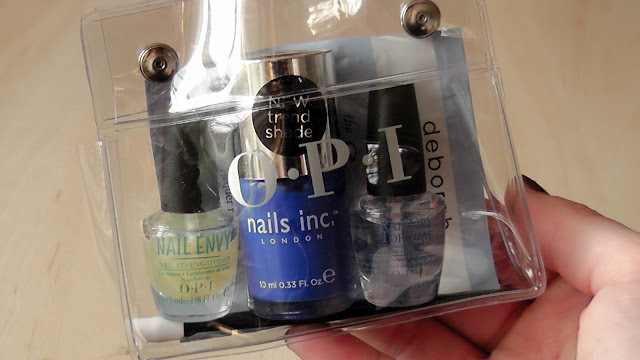 For a base I used a mini OPI Nail Envy, which works wonders at strengthening weak, flaky nails. My colour of choice was Nails Inc. Baker Street, a solid cobalt blue - I adore this shade (plus the London street name is quite appropriate!). To finish off, again in a miniature version, I applied the OPI Rapidry Top Coat which hardens almost instantly allowing me to jump straight off the train and hit the shops..
What are your quick fix nail tips? Whoops, I'm typing this on my phone and hit the submit button by accident! I meant to say that I'm a clumsy person, so I wouldn't even think of doing my nails in the go. the lacquer remover mitt sounds interesting, though! Hehe :-) On a smoother journey it's not too bad! Removing polish is always a chore but these make it so much easier, love them! Do you know where to find good quality orange sticks? I really love Baker Street! It's such an amazing colour!